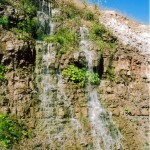 Clappison Falls is a twin waterfall, both coming from separate fissures side by side in the escarpment face. Total width is approximately 3 metres (10 feet) and total height is approximately 7 metres (23 feet). 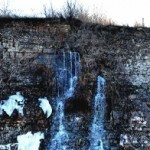 Clappison Falls was first brought to our attention by Elizabeth Berestecki. 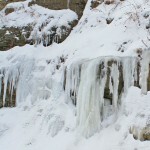 She had indicated to Joe Hollick in early January 2008 that there were some possible waterfalls on the west side of the Clappison Cut where the escarpment face had been widened to allow for the reconstruction of Hwy #6. 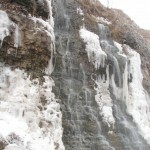 Clappison Falls is located on the west side of Highway #6, about 120 m north of the close-up Old Guelph Road. It was noticed after the widening of Hwy #6 with the cutting of the escarpment and it originates about 3/4 up the rock face (not from the top).